If you're a little bit country and a little bit rock-n-roll, the "country industrial" design may be perfect for you. Mixing the country elements of deep sinks, expansive work tops, and classic cabinetry with stainless steel, iron, and factory style task lighting, home owners can create an eclectic and very functional kitchen. Traditional subway tiles, dark woods, and natural stone flooring are the perfect foil to concrete counter tops, a steel island/bar, and heavy metal accessories, giving this kitchen personality. The industrial touches aren't just for looks, concrete counter tops and the steel clad island will stand up to years of heavy use. Sometimes its more about the details. 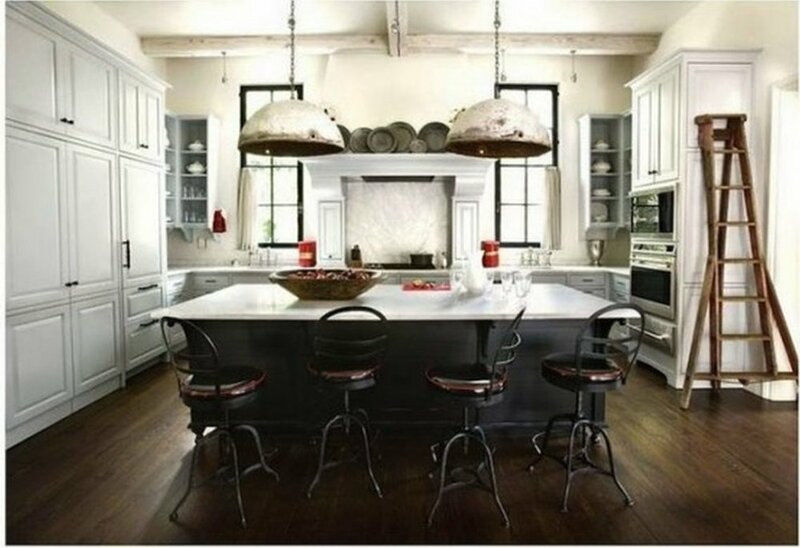 The kitchen above features classic, formal cabinetry is a cool dove grey color, a massive dark wood island and marble counter tops, but the industrial light fixtures, old drafting chairs as bar stools, and dark floors and window casements turn this kitchen from formal to fantastic! Mixed woods, mixed metals, even mixed stone, this kitchen is any thing but hodge-podge. By taking traditional elements, like a raise bar and glass fronted cabinets, but using non-traditional materials, these home owners have created a unique kitchen and dining space that is stylish while being functional and durable. Interested in creating an eclectic kitchen? The designers at Platinum Kitchen Designs can bring your ideas to life.